The Project 111 is a short name for “the Introduction of Intelligence from Abroad Program for Innovation in Academic Schools.” This program is sponsored by the Ministry of Education of China and State Administration of Foreign Experts Affairs of China (SAFEA). The title of the Project 111 in Northwest A&F University is “Modern Technology of Water Saving Agriculture in Dryland of China” and it covers agricultural water resources and monitoring, plant water requirement, water saving irrigation, and dryland farming. Soil and water loss, drought and water scarcity, and desertification are the major eco-environmental issues in the northwestern region of China, as well as in many parts of the world. These problems result in serious eco-environmental deterioration and limit the sustainable development of these regions. This project is to promote international research on scientific and technical solutions for these issues, and also support to provide opportunities for international researchers, engineers as well as academicians to present their research results and development activities in agriculture water efficient use. 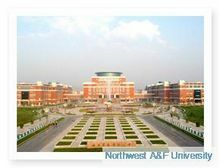 Northwest A&F University (A&F) is a national key comprehensive university directly under the jurisdiction of Chinese Ministry of Education (MOE). The university is co-administered by Ministry of Education, Ministry of Agriculture, Ministry of Water Resources, State Forestry Administration, Chinese Academy of Sciences, and Shaanxi Province. As one of the leading universities in China, A&F is supported by Ministry of Education's "Project 985", whose purpose is to build world-class universities in China. The university is also a member of the"Project 211", a new government endeavor aimed at strengthening 100 institutions of higher education and key disciplinary areas as a national priority for the 21st century. In addition, the university is one of 56 universities authorized to run Graduate Schools in China. Institute of Water Saving Agriculture in Arid Areas of China (IWSA) is a relatively independent and interdisciplinary academic research institution, and a shared multidisciplinary research platform for Northwest A&F University to allow full play to its overall advantages in arid area water saving agriculture. Planning and demonstration at the end of 2007，it was officially approved in July, 2010. Oriented by the national strategy, facing to the whole world and focusing on the arid and semi-arid areas, the institute aims to carry out researches in response to grave agriculture development strategy problems in arid-semiarid areas and key scientific and technical problems of water saving agriculture development in arid area in order to make our institute an international top-ranking base for water saving agriculture technological innovation in arid area and a national organization in arid and semi-arid areas agriculture for development strategy decision making and consulting.